Twice as deep as the Grand Canyon, the Cotahuasi is the deepest canyon in the world, cutting through the Coropuna and Surimana massifs. With numerous hiking trails and vantages points, Cotahuasi is a beautiful region that few travelers get to see. With single and multi-day tours, you’ll get to hike the length of one of the world’s greatest natural wonders. 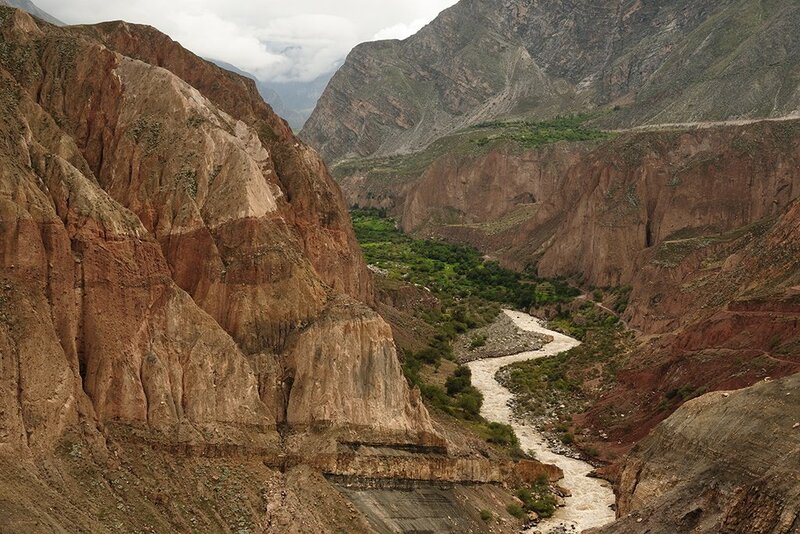 The Cotahuasi Canyon region is legendary throughout Peru for its steep cliffs, waterfalls, and its local inhabitants who follow a traditional way of life. 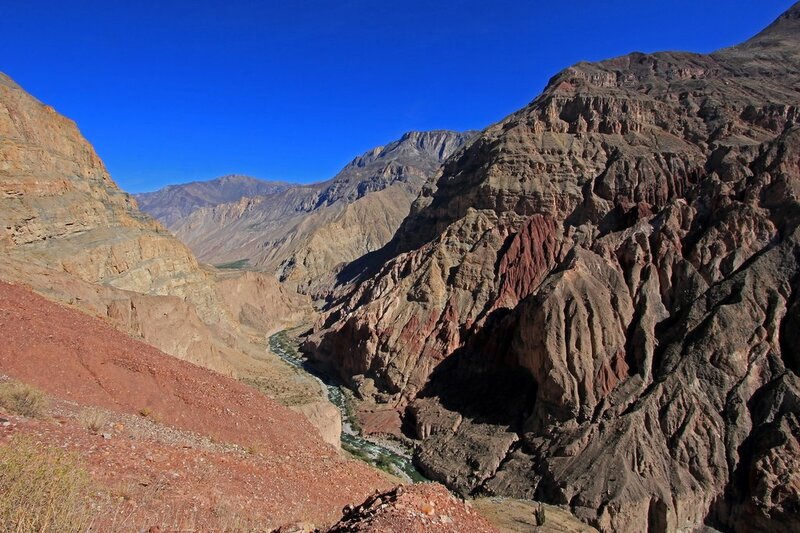 Located north of Arequipa, the canyon is an ideal location for trekking and natural sightseeing. Suspension bridges criss-cross over the Cotahuasi River flowing at the bottom of the canyon, connecting regional trails followed by hikers and locals alike. Because the Cotahuasi Region is remote and lacks consistent transportation, trekking the canyon is quite an off-the-beaten-path experience. 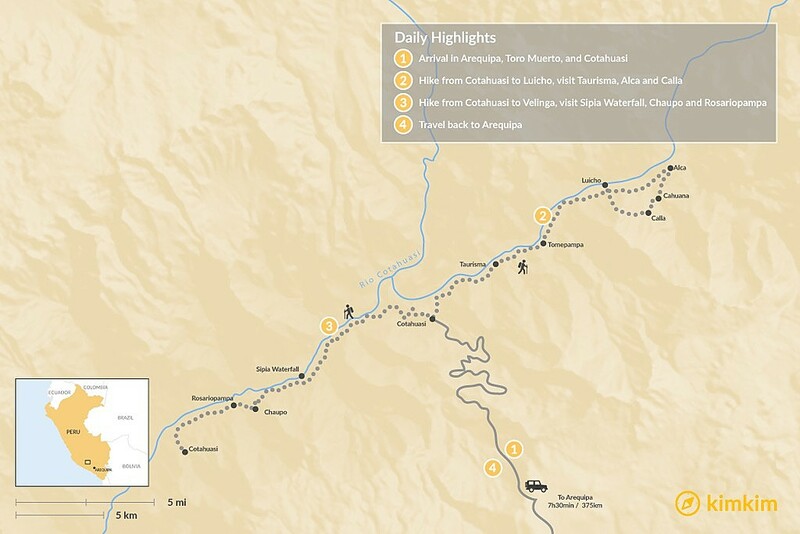 This 4-day itinerary is of medium length, longer than single-day options and shorter than 6-day excursions. For those looking for a compact yet intensive trek, this is an ideal option, especially if you have a special interest in wildlife and Andean culture. Bienvenidos! Welcome to Lima, Peru's largest city and central metropolitan hub, and home to one-third of the country's population. 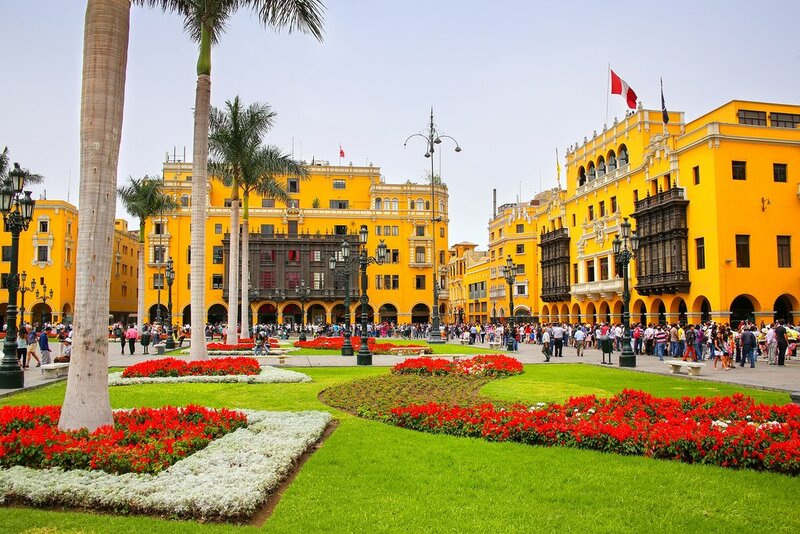 Located at the site of a pre-Columbian indigenous Ychsma settlement, which was conquered by the Inca empire in the 15th century and later by the Spanish conquistadores, Lima has a fascinating history and a diverse mix of cultures. Amerindian, European, Afro-Peruvian, and Asian, especially Chinese and Japanese influences make Lima a dynamic and exciting city to explore. Visit the Casa Aliaga, a colonial mansion granted by chief conquistador Francisco Pizarro to Jeronimo de Aliaga, one of his captains, in 1535. This is the only house from that era that still belongs to the same family. This morning you will be transferred to the Lima airport to catch your flight to Arequipa. Upon arrival in Arequipa, you will be greeted and taken to your hotel to settle in. In the afternoon, you will start your city tour with an escape to the past, walking through the Monastery Santa Catalina. Then continue the visit toward to the Compania Church, famous because of its incredible Baroque style and the colorful Cupula of Saint Ignacio. 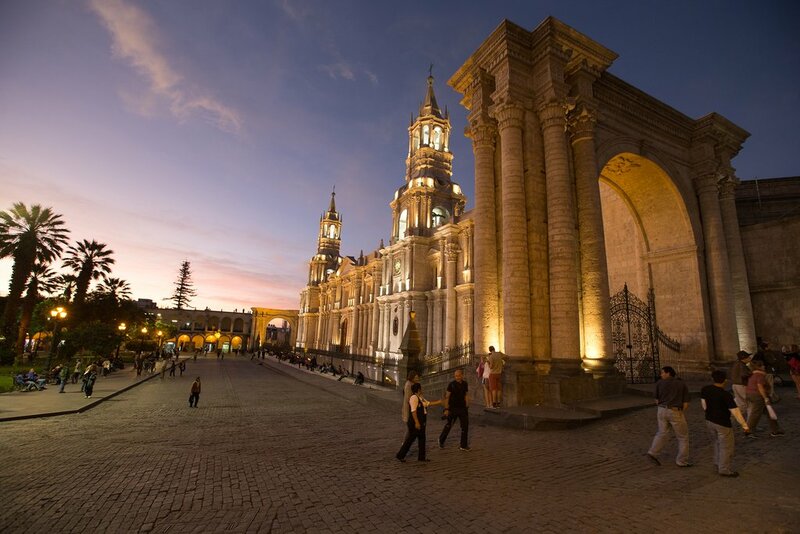 Then head to Arequipa's Main Square, visiting its peculiar Cathedral with their Neo-renaissance style. After, head towards the traditional district of Yanahuara, with its beautiful plaza and views of the volcanoes Misti, Chachani and Pichu Pichu. Our journey starts early in the morning as we depart from Arequipa and take the Panamerican highway, passing through the villages of Vítor and Siguas and then taking a detour to the Majes valley. On the way, we stop to see the 700-year-old Wari petroglyphs of Toro Muerto among 5,000 blocks of trachytic rocks (volcanic tuff from the eruptions of the Coropuna). The petroglyphs depict animals, plants, people, and other geometric designs. We will get to see different villages in the Valley of Majes such as Corire and Aplao. Rice farms and vineyards are common sights, from where pisco and wine are made. As we progress, you will climb up to the village of Chuquibamba, where the asphalted road ends and where we’ll take a short lunch break. The trip continues along the slopes of the impressive volcano Coropuna, the third highest volcano in Peru (6,425 masl). Solimana and Sara Sara, two surrounding volcanoes, will also be within view. Be on the lookout for the amazing flora and fauna of the area (condors, vicuñas, guanacos, vizcachas, foxes, deer, tarucas, eagles, etc.). We arrive at the town of Cotahuasi in the afternoon, have dinner, and finally settle into our accommodations. After breakfast, we leave from Cotahuasi, heading towards the town of Taurisma via a suspension bridge across the Cotahuasi River. Along the way, old cedars, colonial churches, and broom forests line the route. Then, we will visit the town of Tomepampa and its beautiful colonial church. Continuing with the tour, we will stop by the farming village of Alca to observe its church, typical balconies, colonial houses, and ancient cedars. 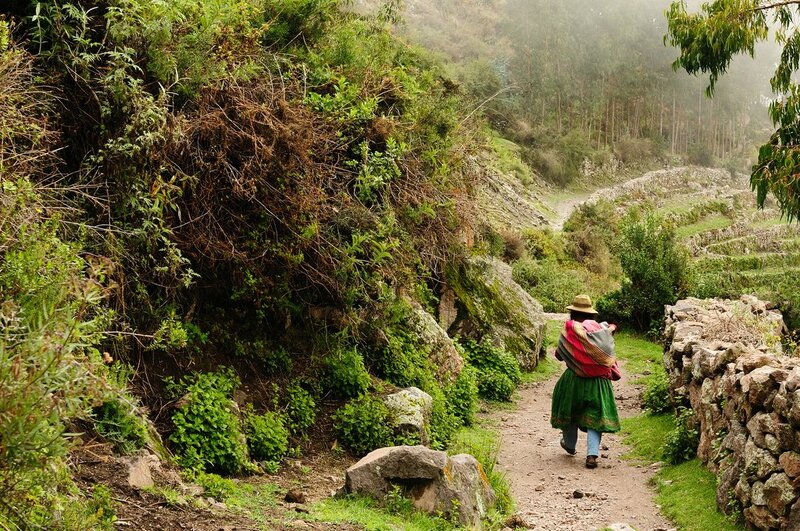 We will then ascend more than 500 Inca steps to the community of Cahuana (3,068 masl), a rich, Andean pre-Inca village. From here, you will get spectacular views of flora, wildlife, hills, villages, terraces, and rivers. 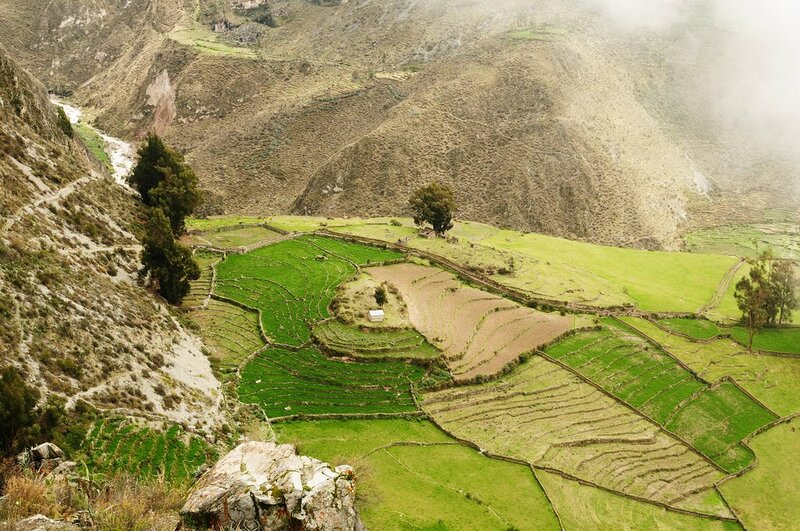 Continue ascending to the archaeological site of Calla (3,335 m), where we will find pyramid-shaped steps and walls up to five meters high in Inca and pre-Inca styles. Later, we finally descend towards the thermal baths of Luicho, where you will have a delicious meal of locally-caught trout for lunch. After lunch, you will enjoy a relaxing bath in the thermal waters of Luicho, which are highly appreciated for their therapeutic properties. Then, we return to Cotahuasi for dinner and overnight accommodations. Very early after breakfast, we will head towards the deepest part of the Cotahuasi Canyon. On this trip, we will observe the fields of Colcan and Piro, which are geologically significant for their warmth and low elevation in a mountainous region. Later, we will visit the Sipia Waterfall, a symbol of the Cotahuasi Landscape Reserve with a height of 150 meters and three falls. You’ll be able to listen to the sound of water crashing upon the rock as you walk towards the picturesque villages of Chaupo and Rosariopampa. You will then pass the Cactus forest of Judiopampa (1,936 m), where 10-meter tall columnar cactus, hummingbirds, and longirostros bats thrive. Finally, we will arrive at the village of Velinga (1,972 m), where we will have lunch and stay overnight. Here, you can visit the ruins of Ayahuasi, observe the 40 types of locally harvested fruits, the eco-museum, and the "Valle Bello" vineyards. Taste the rich, organic wine and experience the winemaking process at the old mills. If you are feeling up to it in the afternoon, we will descend to the thermal baths of Niñochaca (1,729 m) for a relaxing soak. Then, we will return to our lodging in Cotahuasi. 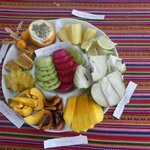 After breakfast, we will take a short walk through the town and return to the city of Arequipa, stopping for lunch on the way. We will arrive back in Arequipa in the afternoon. 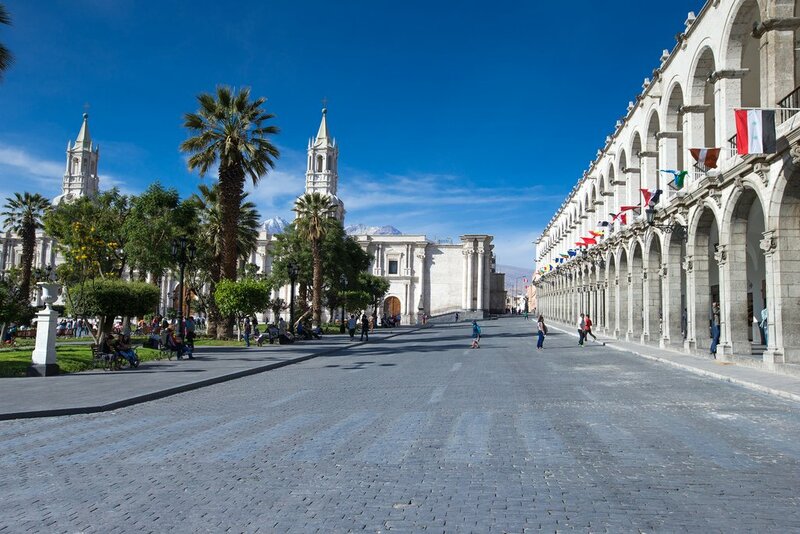 Spend the rest of the day relaxing and enjoying the beautiful sights and tastes of Arequipa. Today is your last day in Peru! You will be met at your hotel for a transfer to the Arequipa Airport, where you will board your homeward-bound flight. Buen viaje! If you prefer, you can spend the third night in the village of Velinga instead of Cotahuasi. There are also shorter routes you can follow with different itineraries, but you may miss out on the Sipia waterfall and certain bridge crossings as a result. Depending on how much time you have, we can adapt an itinerary that best suits your time frame. Trekking in the dry season is recommended, as pleasant, sunny weather makes for an ideal experience. Temperatures range in the 60s and 70s F (15-25 C) during the day when most of the hiking and activities will take place. However, temperatures can dip into the high 40s (7-8 C) at night, so make sure to bring enough layers and warm clothing. Visiting Cotahuasi during the rainy season will be less enjoyable as muddy conditions and high water levels make hiking uncomfortable. Additionally, there will be fewer opportunities to see local agricultural traditions and customs. 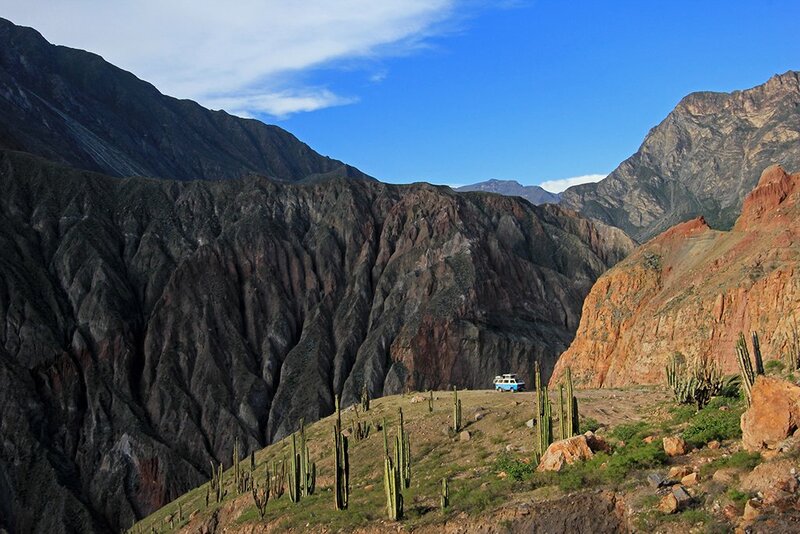 Cotahuasi is relatively remote compared to other regions in Southern Peru. A single route connects the Cotahuasi region to Arequipa. If you take a bus or combi to Cotahuasi, expect the trip to take up to 10-12 hours. Most buses will leave in the late afternoon and arrive early next morning, making for an overnight trip (roughly 5 pm to 5 am). Renting your own vehicle is possible and makes for quicker travel, but insurance difficulties and lack of road knowledge make this option more risky. Getting to Arequipa is most convenient from Cusco or Lima. Flights are quick and easy, while a bus trip can take over half a day. To enter Peru in the first place, you will most likely have to land in Lima’s international airport first. However, if you will be doing other activities in the Cusco area first, Cotahuasi is not too out of the way, although it is not exactly accessible either. Bring plenty of comfortable clothing, including long sleeves and layers for the nights. A hat and sunscreen (high SPF) is recommended for sun protection. Bug spray is also necessary if you want to avoid the various biting flies in the shade. Make sure your shoes are sturdy and appropriate for hiking, and that your overall belongings are lightweight.